So… something happened after Journal 3 – just getting on with it. As your comments have come gratefully pouring in, my little brain went KABOOM… and I started hustling. I promise to sit down and read your wonderful comments tonight…. I’m excited at what you had to say! But I think it’s safe to say, the theory has busted me out of the poor me zone, and there’s been lots of good things happening as a result. My garden is never done. Ever. But most recently when feeling overwhelmed, I’ve gone to plunk my sorry self on the lawn near the soil, to pull a few weeds. That move has had an impact. It’s given me something mindless to focus on. I can still think about stuff, but I’m also productive. And I knew just where to focus. I had this two full pallet walkway in the front yard that had rotted to nothing. Heaving the saturated and broken boards to the dump, this glorious weed filled dirt patch was waiting in return. So I poked through the shrubs in search of a well hidden bird bath. Finally, a proper place for it!. A cement stepping stone was put into place under the birdbath first, to offer stability. This little spot has potential! The perennials around it are pretty wonderful, for me not having planted or maintained it. It just needed cleaning up. After fluffing up the soil, it started to take more shape. And then there’s that bucket… hmm…. I really love garden junk placed where there are no plants yet. They make great garden fillers. Next up, a little flower garden bed edging took place. 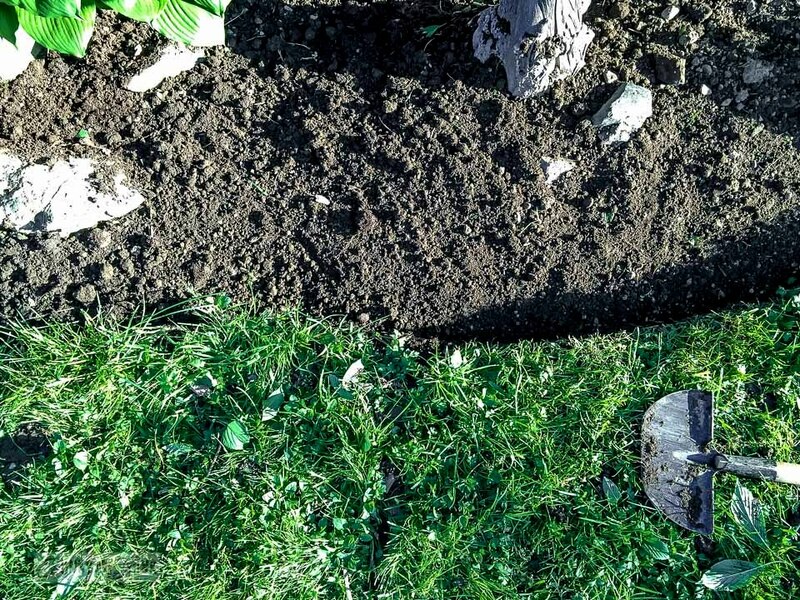 How I edge flowerbeds like a pro is HERE. Then I turned to my left and watched neighbour Janette dig up some full grown flowers from her own yard, moving them to another place. Ahhh… smart girl. Grabbing my shovel, I dug up this clump of… purple? 🙂 Then simply placed the bucket on its side behind them. I LOVE the illusion of the flowers spilling out of it! Then I dragged a small picket fence strip behind the bed to hide the stained sidewalk garden hose. I was really loving how everything was coming together. And I should also say this. I’m not one of those people where my garden showcases a lot of soil. I love everything to have a farmyard rambling look. To me it’s very full and natural. Which means, things tend to get overgrown. Quickly! So I cut a few things back, but for the most part, most stayed put. Remember the barrel garden orb HERE? The purple flowers have taken over! And I secretly love it. The bench works really well too. 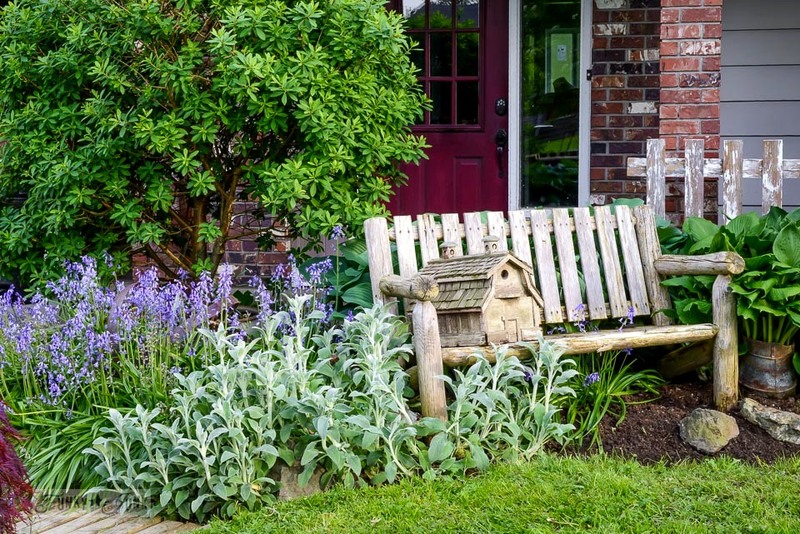 If you have a flowerbed that doesn’t have a lot of varying height on its own, a bench really brings another level of interest into the space. 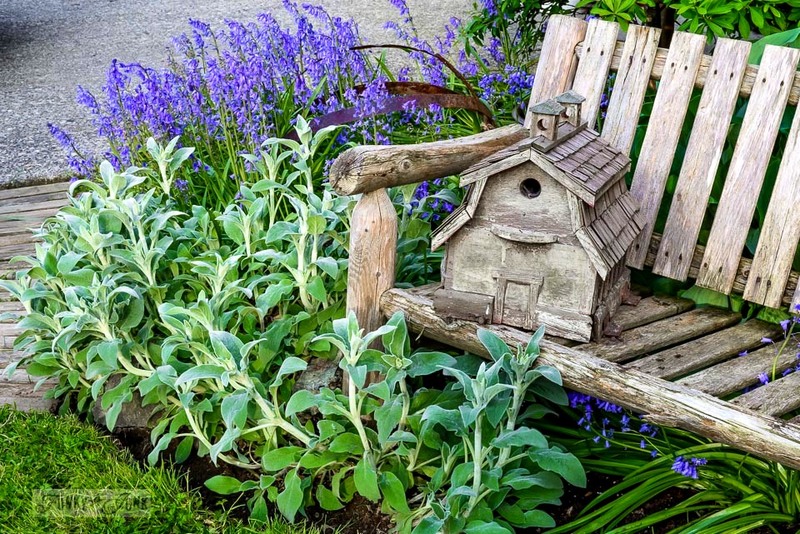 And serves as a place to plunk a birdhouse or pot of flowers. 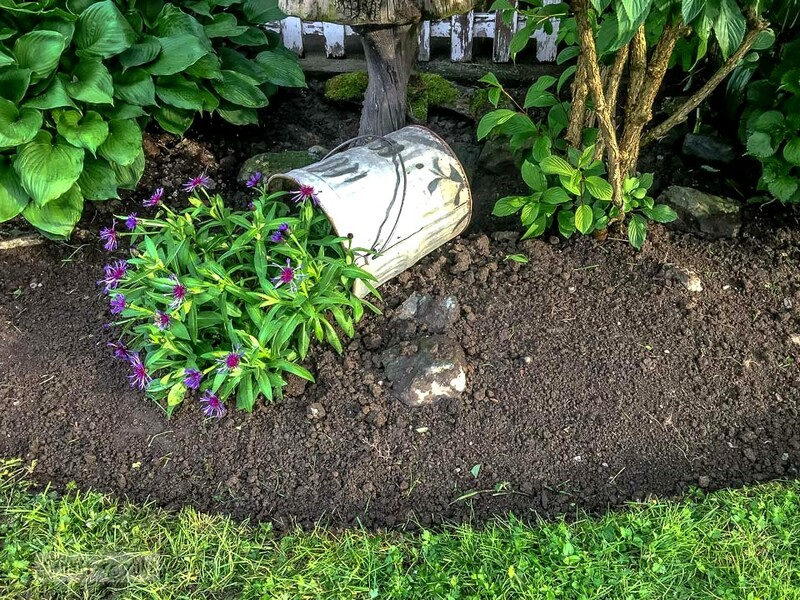 This rusty chunk of stove pipe was thrown in this bed before the hostas started growing. Isn’t this outcome awesome?! 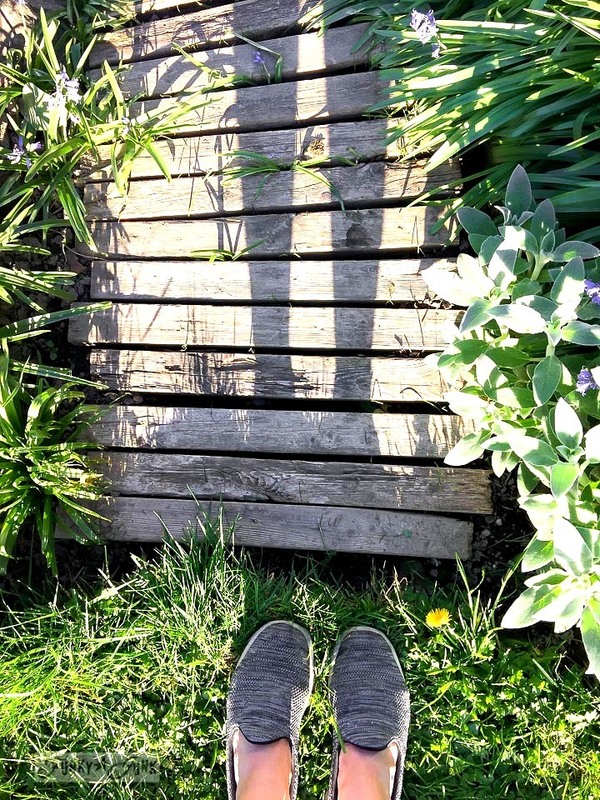 Have you done anything fun to your garden yet? I love this – I use the cans in my herb garden. Have one with oregano growing out of it. I haven’t done much this year in the way of new projects for the garden other than spicing things up. We’re getting ready to sell our farm so the focus is all about getting that presentation ready. I agree though the garden is a great place to plunk even when I’m not inspired to do so because the activity is so rewarding and comforting. Thank you so much for the inspiration; after living in our home for almost 7 years, I want to (finally) work on the flowers out front. I appreciate so much you sharing this! Love it! The flowers flowing out of the bucket look is so cool! 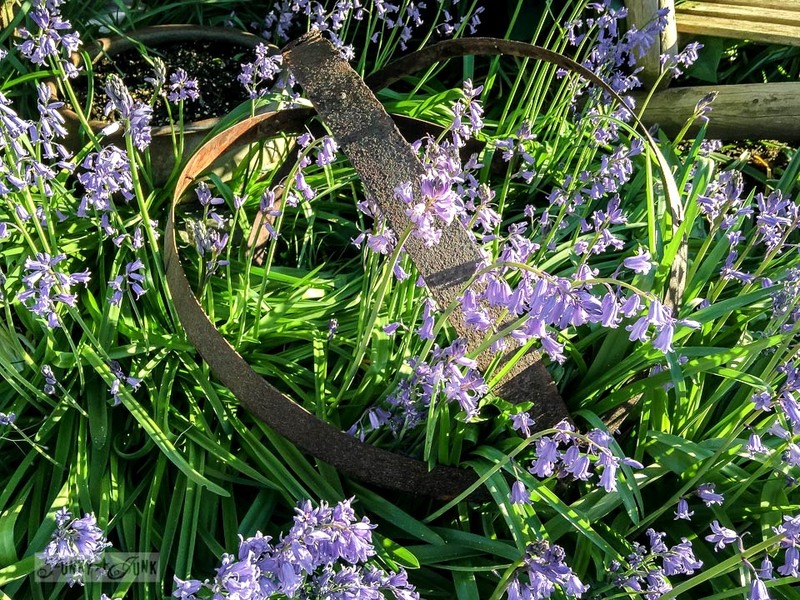 I love using things past their useful life as garden “art”. The trick us to keep my hubby from throwing it away so I have to either hide it until inspiration strikes or tell straight out to leave it alone. I’m working in my yard trying to get things done before the hot summer hits. So much to do and I love being out there! Have a good rest of the week. Good thought on working at it hard before the hot summer months. I love working in the evenings in summer, such a nice way to end the day! Love you site. Can’t wait to get to our new home, tiny house in Oregon and start on my yard. Same with most of my perennials I split to move to other locations before they are too big. I love the bucket looks like the flowers have just tipped over. 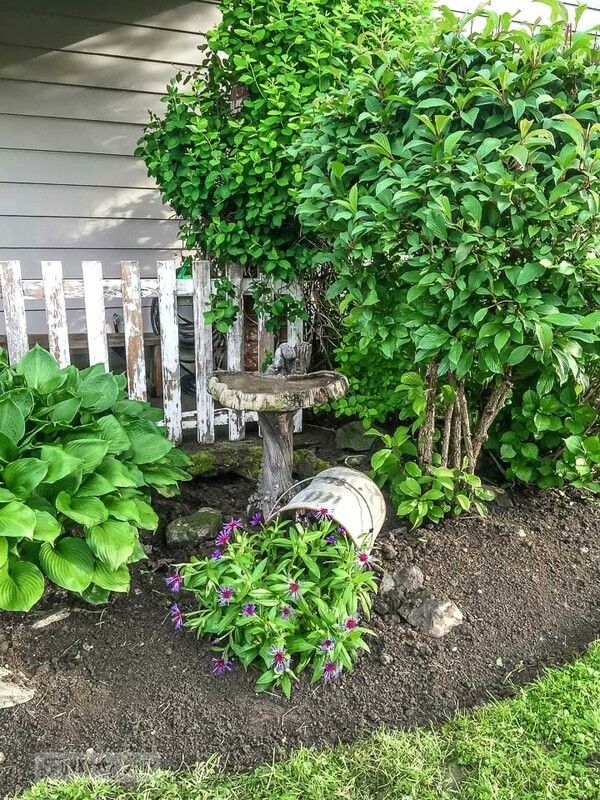 Gardening is my calming place I love seeing what I have created flourish , when people stop by they are amazed at what they find hidden you can see them looking everywhere. Have a good one Ann. 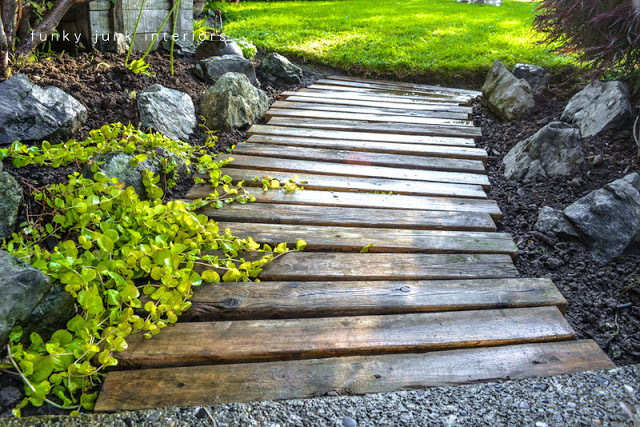 Your garden looks simply beautiful! I have begun clean up and we cheated and had someone come out and mulch my flower beds. I have what were two old wooden tired adirondack chairs on my back patio. I saw a vision for them – a coat of dark olive green wood stain and using the Flower Market stencil I bought from your store, I stenciled the seats with the words and then used some other stencils I had to add pops of dark purple and orange to the seat backs in a somewhat floral design. A quick coat of polycrylic finished them off and then I smiled, they turned out wonderful. You and your ideas are inspiration so many times in my home, you have no idea! Thank you for that!!!!!! Sharon… your chairs sound fabulous! Thank you for your purchase! That looks great. I agree with adding height to level flower beds. 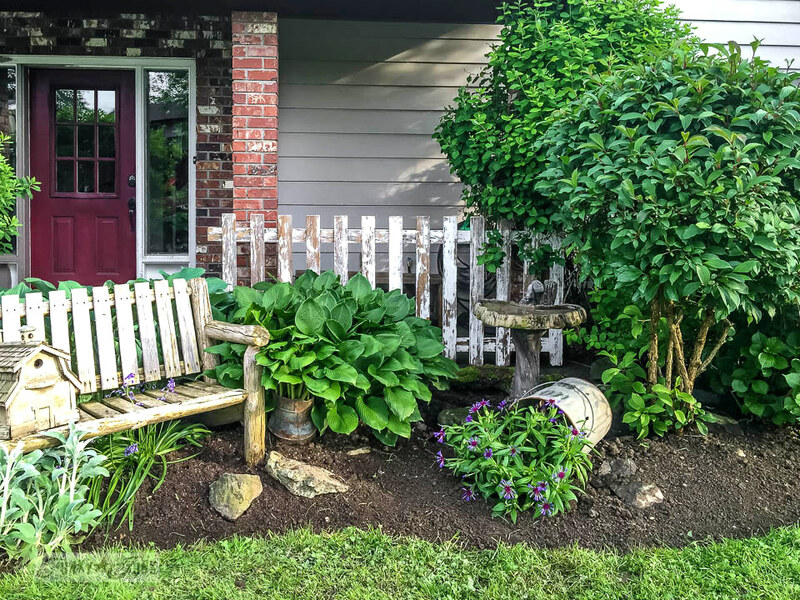 About five years ago I moved some variegated hostas to this house using a huge pot, always meaning to take them out of the pot and pot them into the garden, but the hosta pot looks so wonderful and rises above the rest of the flower bed, that they stayed. 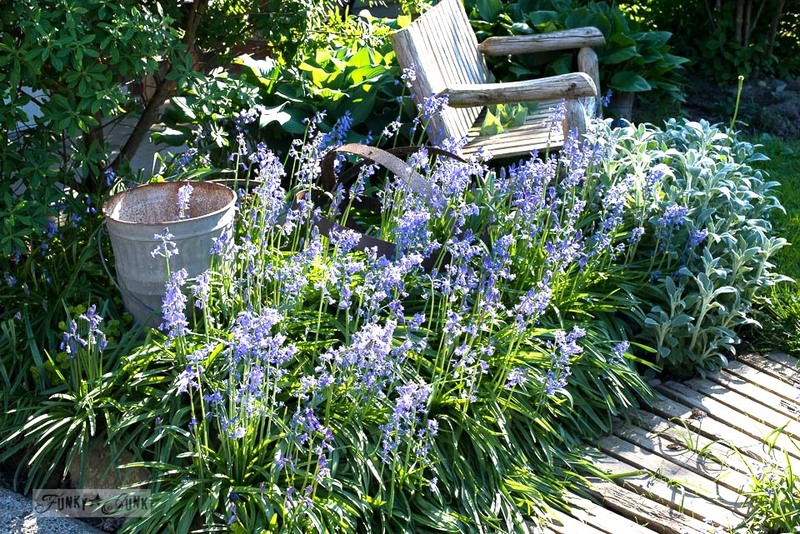 I also love the crowded British garden look and is exactly what I’m going for here. Well done you! Wow, so hostas do well in pots! I’ll have to experiment with cutting mine back and trying that next spring. 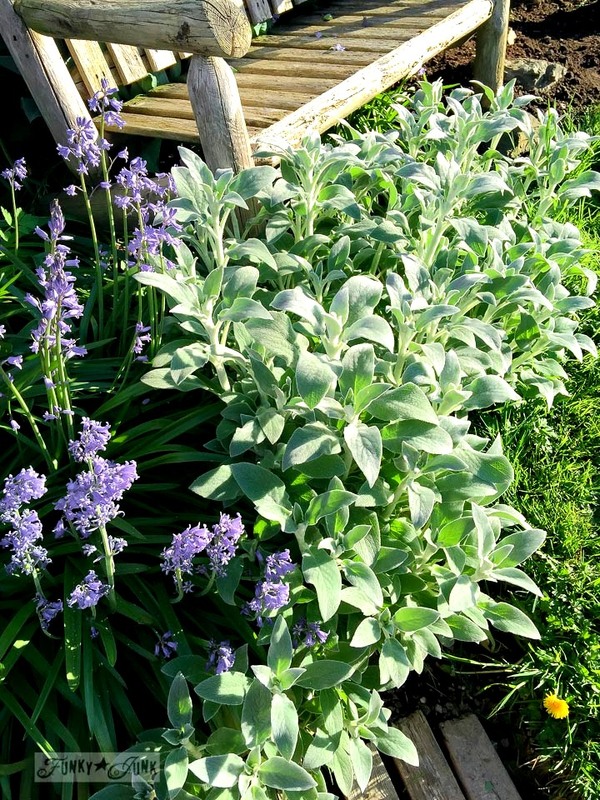 Ahhhh right… my gardener brother always use to call his full flowerbeds English gardens. I’ve always loved that too, everything looks so established. Your garden looks so fun! 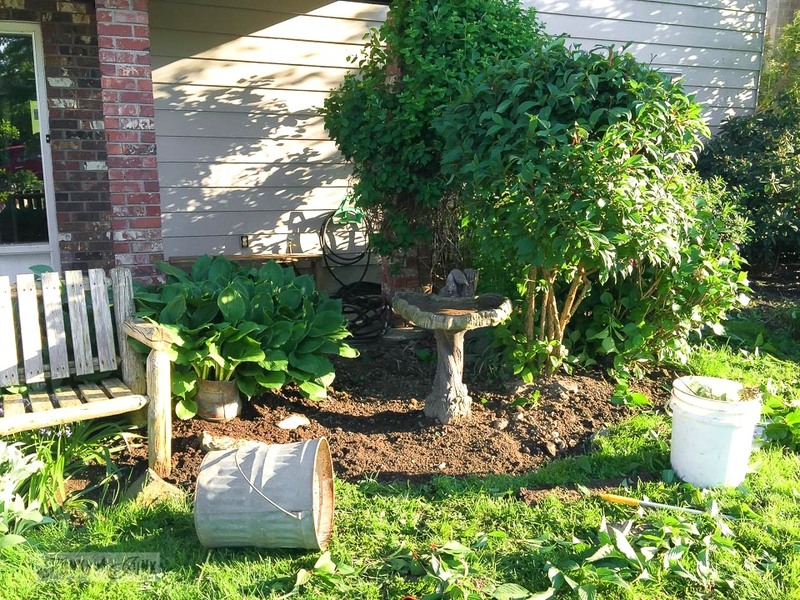 Love the overturned bucket, and the hostas coming through the stovepipe is so clever. Great ideas that would be easy to replicate. Thanks! Love the look you accomplished. I too have been cleaning out the weeds in prep for mulch (which arrives in a couple of weeks). We usually end of spreading 8-10 yards of it around all the beds. By the way, I do have too many flower beds to maintain but the mulch helps once it all gets organized. 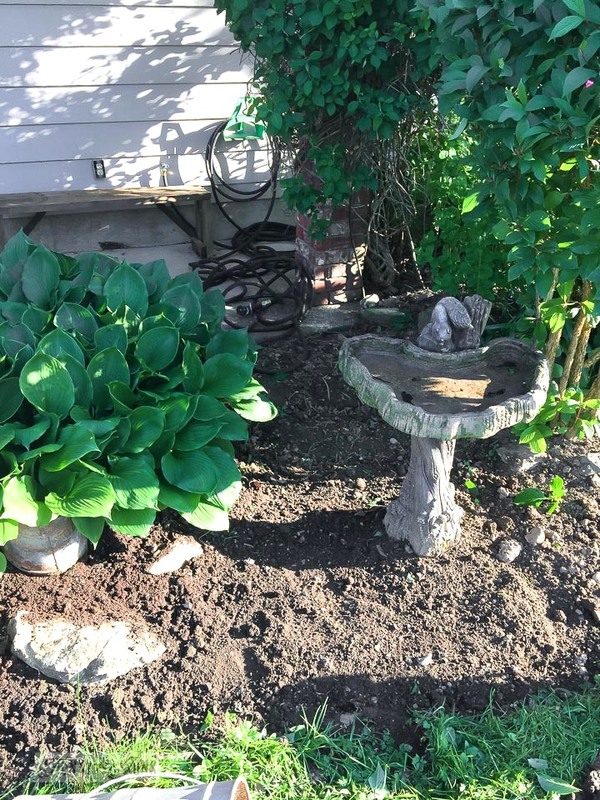 I just moved my bird bath too next to my lilac bush. The birds can hide in the bush and dash for a drink. Only have my back gardens to clean up yet..really the largest and hardest to do. Waiting for the pouring rain to stop so I can work on them. Everything is turning really green and budding out quickly. Spring has arrived in Michigan along with a couple of pairs of bluebirds that I am thrilled to feed and watch them build nests. I’m so with you Eloise, I haven’t touched my backyard yet, just giving it all to the front for now. I’m gauging how much effort it takes to keep up. 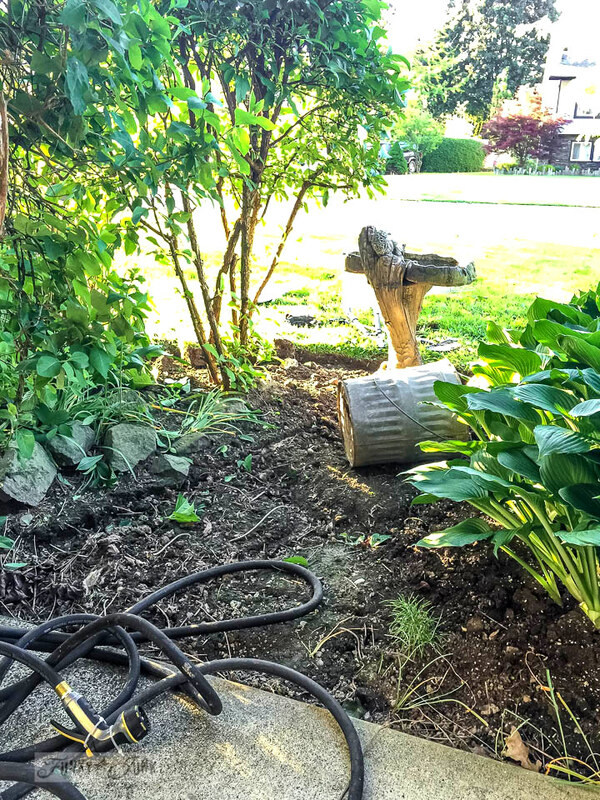 This has been very telling… looks as if I need to do some additional diminishing in the backyard unless I want to weed full time! I love bird nests! Glad you get to experience some yourself! Love this.. I am using all kinds of wonderful things for my flowers. I have a huge wagon made of wood and iron than I have roses and heather in. sunflowers around it. Soon anyway, they are about 12″ right now. Spring is wonderful, makes you feel young again. Take some deep breaths. Oh my goodness… I’d bet that visual is gorgeous Gail! I love a crisp edged garden, nice job! In spring I top coat all the beds with peat moss. I have a nice base of it now, makes pulling weeds a breeze and enriches the soil. Turns darker as it sits, unlike mulches that get tired looking by mid summer. Ohhh peat moss! I’ll have to try that! I thought I had to get fancy with new soil, but you’re right, it diminishes so quickly. I’m trying your way, thank you! I have been working in my flower beds too. Thinned out my irises and moved some others plants around. I love what you have done looks great.Working outdoors in the flower bed is so fun and takes your mind off all your problems. Sharon from Michigan I would love to see what you did with your chairs and the stencling. Beautiful! 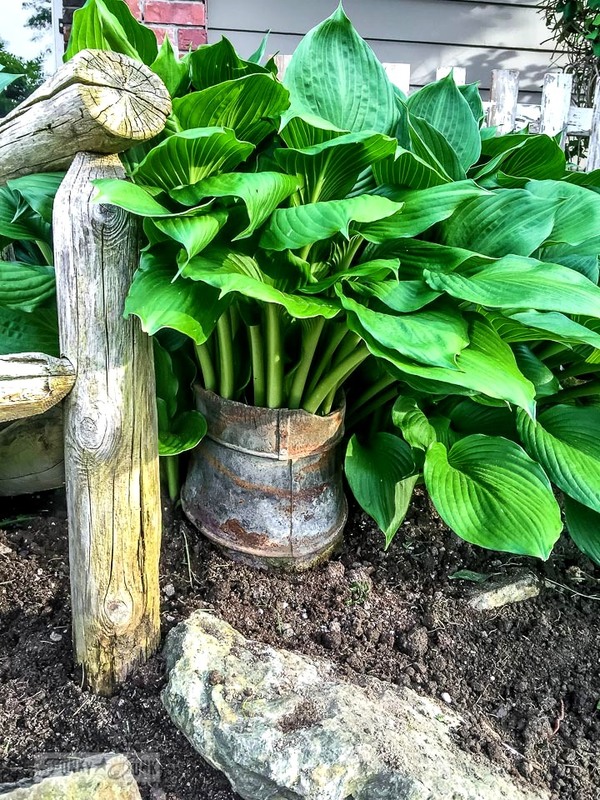 Is the bucket bottomless that is holding your huge hosta? I tired planting a hosta in a container for the first time this summer and wondering how it will go. Yours looks great! Thanks! Your yard is looking beautiful. It makes me almost want to work on mine. I really enjoy your post I certainly hope you don’t change one thing. 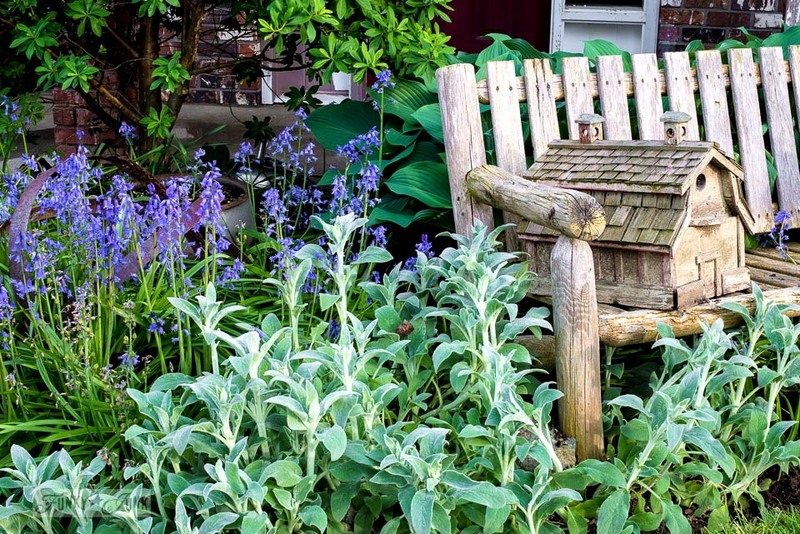 I love your garden and especially the rusty and junky accents! I would love to do some of the same in my yard but we’re still cold here. Our last chance of frost isn’t until May l0th, and the way the weather has been, that’s true to form. Is it nice and warm where you are now. Your photos look like it. Your piece of a picket fence is awesome! Thanks for sharing your progress and keep on keepin’ on! I absolutely love how this little space turned out! 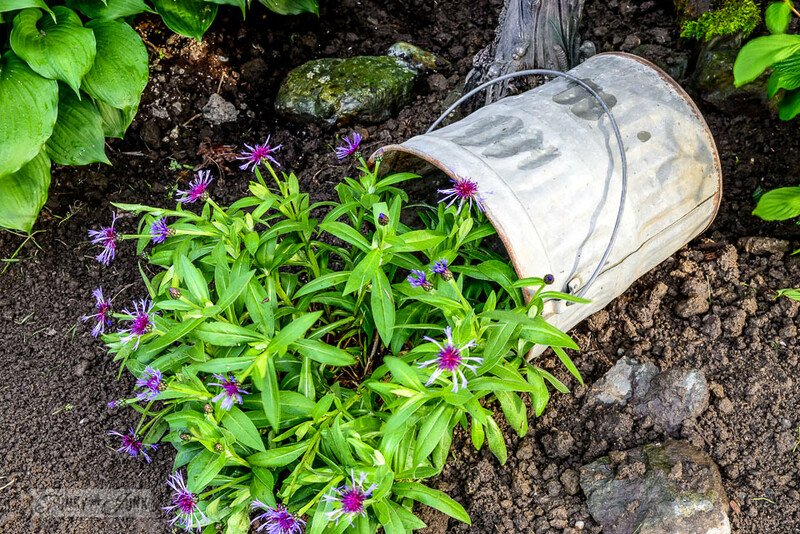 Just the right mix of junk and structure 🙂 Do you know what the purple flowers are that you planted by the bucket? I have an old metal planter that I lay down with wave petunias “spilling” out but I love your flower choice here, great job! Looks GORGEOUS Donna! You’ve done a wonderful job! Here in the manufactured home park where I live, the gardener has a tipped over wheelbarrow with flowers spilling out. Your garden is lovely. OK, you have inspired me! I’m getting on with it during my next days off and if I can make my gardens look as great as yours, I’ll be a very happy gardener. Thank you! I love the spilled flowers out of the bucket! A much more original look than the overused, overturned wheelbarrow. I’ll have to keep an eye out for an old bucket. In case you wanted to know, those purple flowers are Centaura montana. 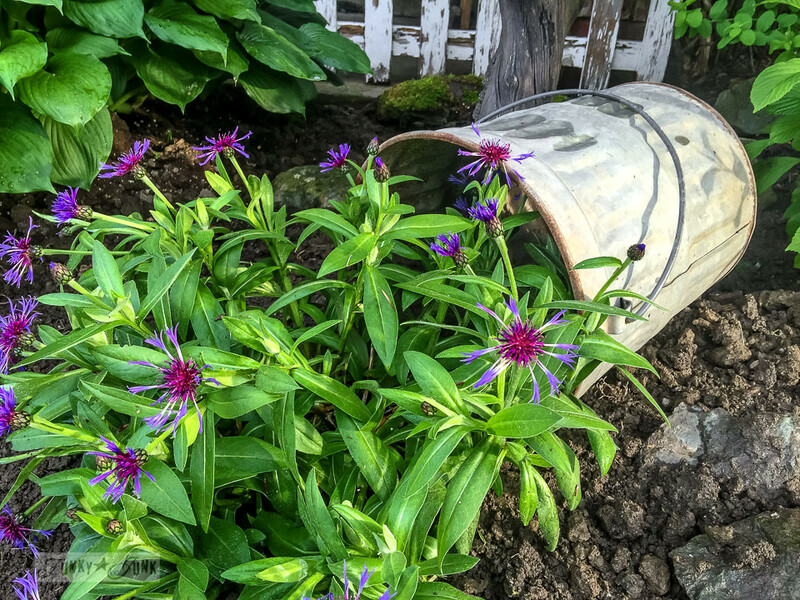 Here they are called perennial cornflowers. Thanks for the inspiration! Donna, I would really love to know the name of the purple flowers spilling from the bucket! So gorgeous and unique. Do any of your readers recognize them? I wonder if they are native to Canada or could they survive in PA? They are on my Repurposed Gardener wish list. I didn’t see the Hostas. Do I need t click on something else? I love your “after” pics! I also love to use “junk” to beautify my garden! Hi Sharon! The hosta picture is the one with that tin that appears to be holding them up. I laughed when I saw that transpire… I had forgotten I put the stove pipe chunk there! A reader asked what the plant was that you have that appears to be spilling out of the metal bucket…They look leaves familiar but I am not sure what they are as I work mainly in interior landscaping…What can I tell them? They look like one of the bachelor button varieties to me. There are several types. Oh Donna!!!! You are SOooooo creative!!! I wish I could think like you do!! Your beautiful garden area *remake* is absolutely gorgeous!!!!! I wish you could come help me in mine!! I love your posts and look forward to them every day!! !